Phnom Penh Governor Pa Socheatvong said on December 26 that he hopes Hanoi – the capital city of Vietnam – and its Cambodian counterpart will push ahead with cooperation in all aspects. He made the remark while meeting with Secretary of the Hanoi Party Committee Hoang Trung Hai in Hanoi. He said he is impressed with Hanoi’s enormous attainments in recent years, noting that Hanoi and Phnom Penh are paired cities and boast long-standing cooperation. Delegation exchanges at different levels have helped enhance ties between the two countries and the two capitals. 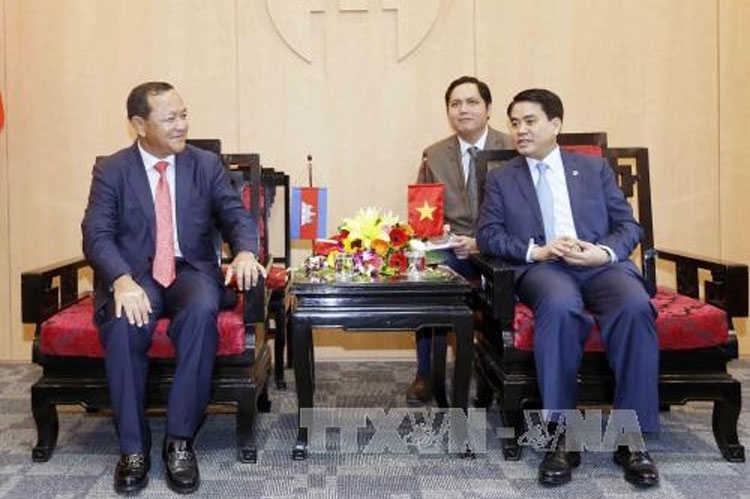 Highlighting the cities’ traditional friendship, Hai said the official visit to Vietnam by Cambodian Prime Minister Hun Sen on December 20 once again affirmed the countries’ fine amity. He voiced the belief that through delegation exchanges at all levels, relations between the Vietnamese capital city and Phnom Penh of Cambodia will be reinforced. Also on December 26, Chairman of the Hanoi People’s Committee Nguyen Duc Chung had a working session with the Phnom Penh delegation. Chung informed his guests about local socio-economic development and thanked the Governor and administration of Phnom Penh for providing optimal conditions for Vietnamese enterprises, including Hanoi’s, to do business there. Pa Socheatvong said Phnom Penh has a population of more than 3 million and posts an annual GDP growth rate of 7.2 percent. Speaking highly of Hanoi’s development, he expressed his belief that the city will reap more achievements while relations between the two countries and the two capitals will become even stronger.